Two Stage Countertop Filter 10"
A 2 stage counter-top water filtration system that generates clean water from tap water (chlorinated or non-chlorinated water supplies). This filter system sits on the counter and connects to the kitchen faucet. This countertop filter will not connect to pull out kitchen faucets. If your main kitchen faucet is of the pullout type, you will need an undersink filter system. This system is pre-assembled and it comes with faucet adapter. The system is potable; it can be disconnected and moved to a new location. The system comes with standard 2.5x10� cartridges: 5 micron sediment filter cartridge as Stage 1 and 0.5-mic Carbon Block Cartridge as Stage 2. Ceramic filters are effective at removing dirt, rust, sand particles, bacteria and other micro-organisms. A caramic filter cartridge can be cleaned thirty times (can be used for up to three years!). 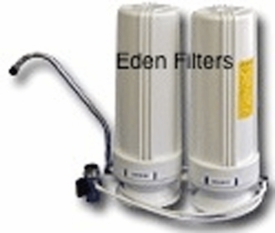 Carbon filters will remove - by adsorption- chlorine, taste, odor and organic matter. This cartridge can be replaced every 6-12 months. This water filter system will produce continuous supply of fresh, crisp, great-tasting water from the tap. Desirable minerals like calcium, magnesium, potassium, chlorides, and fluoride are not removed from the water by the filters. If you have specific contaminant that you want to remove from water then we suggest that you consider the undersink three stage filter system. This water filter system will produce continuous supply of fresh, crisp, great-tasting water from the tap. This system comes fully assembled with all needed hardware to connect to the faucet. The purchase of this product comes with with one year limited warranty on all parts.